Masters 2019: McIlroy, Rose, Johnson... Woods? Who will win the unpredictable major? Welcome to your easy to use guide for golfers searching to find accommodation and restaurants close to golf courses throughout Britain and Ireland. This is a unique one stop shop for golfers which allows you to find and book your accommodation and search out all the best restaurants close to any golf course in the UK and Ireland. Contact us directly by phone +44 (0)1943 511148 or email: info@hotelsneargolfcourses.co.uk or info@restaurantsneargolfcourses.co.uk and we can arrange your golf and your accommodation for you at very competitive rates and also make any table reservations for you at your chosen restaurant. Golf Specials at The K Club. 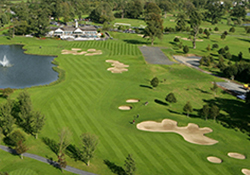 The Palmer Ryder Cup Course and The Smurfit Course are considered two of Europe's finest Championship Courses recently voted on the top ten worldwide golf resorts by CNN. A fairway from your usual hotel. With access to our nine celebrated golf courses as well as many other affiliated golf courses across the UK, Spain and Portugal, we are 'driven' to deliver your perfect golfing break. From Macdonald Portal Hotel Championship Golf Course to Spey Valley Championship Golf Course in the Scottish Highlands, your only distraction should be the panoramic scenery and choosing your next club. We've also got golfing breaks in Spain and Portugal which include accommodation at our Macdonald Resorts and superb Meditarranean golf courses. 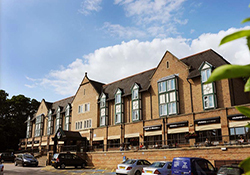 Stay at The Village Leeds North. The perfect venue for your golf break in North Leeds, close to Headingley, Moortown, Alwoodley and Cookridge Hall Golf Clubs. If you experience any difficulty using the site the please contact us at info@hotelsneargolfcourses.co.uk and we will be happy to assist.